Acne was a normal part of my teenage years, and I even struggled with bad skin into University (and beyond). I never got too many blackheads, but when I did, I wanted them gone right away. If you’ve dealt with blackheads before, I’m sure you feel me! One thing I know for sure is that there’s a certain way to remove blackheads so you don’t do damage to your skin. Remedies like a blackhead removal mask work wonders for getting rid of blackheads once and for all! Read on for the best blackhead products and treatments for flawless skin. If you’ve had blackheads before, you know they’re pesky little things, but do you know what causes them? Blackheads are small bumps that appear on the surface of your skin that look black or dark in colour. They appear when a hair follicle becomes clogged with dead skin cells and oil, and when this material gets oxidized by the air, it turns black. Blackheads are a mild type of acne that appear anywhere from your face and chest, to your back, neck, arms and shoulders. 1. Apply a Blackhead Face Mask: Using a blackhead mask is the number one step in properly removing blackheads (we’ve listed 5 of our faves below, and highly recommend Gemmaz Purifying Black Mask Peel Off Mask). Blackhead masks penetrate your pores, extracting the dead skin and oil so you’re left with flawless skin! 2. Be Careful with Pore Strips: Pore strips have made a name for themselves as the go-to blackhead removing remedy, but they can end up doing more harm than good. They’re very abrasive, and can actually make skin conditions worse. They also strip your skin of natural oils that keep it healthy. 3. Don’t Squeeze: It can be (more than) tempting to squeeze your blackheads to get rid of them, but you risk tearing the pore walls when you do this. When this happens, bacteria can spread into the surrounding tissue and you’ll likely end up with bigger breakouts all over your face. 4. Go Natural: There are a lot of natural products that can help you get rid of blackheads. Natural products are easy on the skin and can leave your complexion in much better condition than it started out. 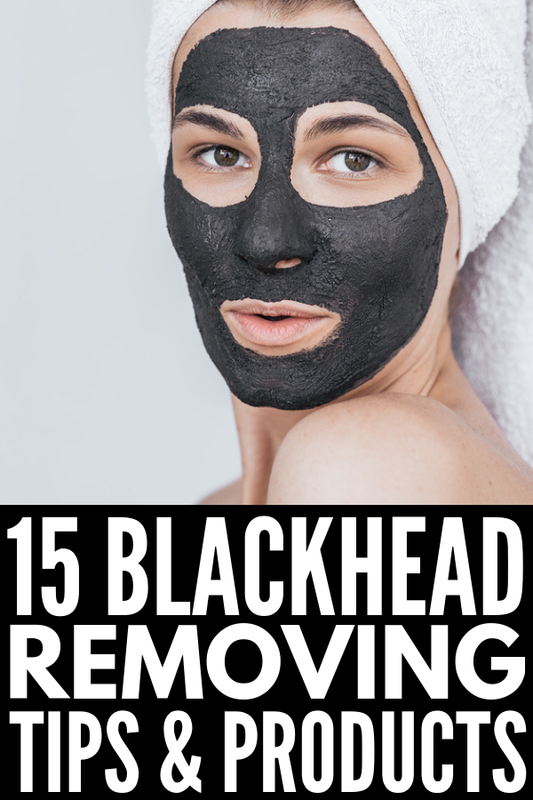 Natural ingredients like honey, tea tree oil and activated charcoal are used to make blackhead masks (check out 3 simple DIY blackhead removal mask recipes below). 5. Seek Out a Professional: The last thing you want to do is damage your skin. If you’re having issues removing blackheads yourself, get a professional facial that uses extractions to remove blackheads without any damage. 1. Start with a Clean Slate: Make sure you and your skin are prepared before you start the blackhead removal process. Wash your hands well to prevent spreading bacteria on your face, remove any makeup you’re wearing with makeup remover or makeup wipes, and make sure the water temperature you’re going to use on your face is warm. 2. Don’t Scrub Your Skin: Having blackheads doesn’t mean you’re too dirty. You’ll do more damage to your skin if you’re rough with it and scrub really hard. Cleanse your face gently to prevent further harm. 3. Use a Light Moisturizer: Whatever you do, don’t stop moisturizing your skin. It’s true that thicker, creamier moisturizers can make blackheads worse by clogging your pores, but lighter, milkier products like La Roche-Posay’s Effaclar Mat Face Moisturizer normalize your pores and regulate oil production. Your skin needs hydration and a good moisturizer is key! 1. Gemmaz Purifying Black Mask Peel Off Mask: Formulated with activated charcoal, this blackhead peel off mask works to get rid of blackheads, dirt, impurities and excess oil to give you the flawless skin your crave. 2. Nylea Blackhead Remover Mask: Made with safe ingredients like aqua and glycerin, this blackhead mask will help you tackle blackheads and blemishes, and make your skin firmer and healthier! 3. April’s Dead Sea Mud Mask: A mild and deep skin cleanser, this mask contains healthy minerals like magnesium, calcium and potassium, and skin-boosting substances like Dead Sea mud, aloe vera, shea butter and jojoba oil. 4. Vassoul Suction Black Mask: This mask doesn’t just help remove blackheads, it exfoliates and cleanses the skin for a flawless complexion! 5. Essy Blackhead Extractor: The amazing thing about this mask is that it contains powerful bamboo extracts that can remove dirt and extra oils! It also comes with a tool to help remove blackheads. This homemade mask uses a combination of baking soda, activated charcoal and bentonite clay. Baking soda is an anti-inflammatory that opens the pores and helps eliminate acne blackheads; bentonite clay absorbs toxins and draws out dirt, helping regenerate skin tissue; and activated charcoal clears and shrinks pores, draws out dirt and tightens skin for a flawless finish! This DIY mask features bentonite clay, activated charcoal, tea tree oil and apple cider vinegar to detoxify and purify the skin! While the charcoal and clay take care of pulling dirt away and detoxifying the skin, organic apple cider vinegar has amazing healing compounds that kill bad bacteria, and tea tree oil has powerful antiseptic properties and treats skin issues. Made with honey, a natural antibiotic that cleans blackheads, baking soda and fine sea salt, an antibacterial that unclogs your pores, this mask will make your blackheads disappear and leave your skin clear and soft! If you’ve been struggling with blackheads, these masks and products will be your saving grace! Try them the next time you have a blackhead breakout for flawless skin! If you loved these blackhead removal mask products and treatments, make sure to share this post on Pinterest! And if you want more skincare tips and tricks, please follow our Great Skin board on Pinterest!